To take advantage of this special offer, simply add any in-stock item/s to your basket worth £100 or more and enter the offer code CFSANTA when prompted. The free secret Santa gift will be automatically added to the order. 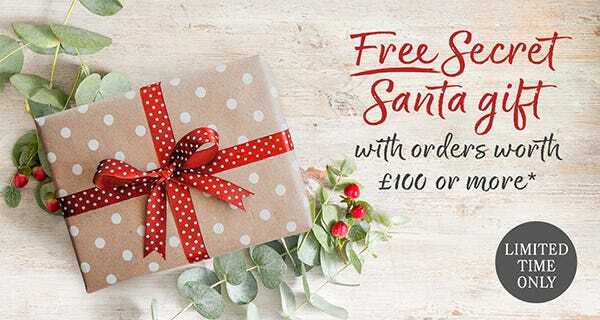 To redeem this offer of a free secret Santa gift, simply add any item/s worth £100 or more (excluding delivery) to your basket and enter the offer code CFSANTA when prompted. The free secret Santa gift will be automatically added to your order. Cannot be used in conjunction with any other offer. This offer expires at 11.59pm on Tuesday 11th December 2018. Promotion available to the first 100 customers who redeem the offer. Available to UK customers only as the free gift cannot be delivered overseas due to carriage restrictions. If you return any items for a refund, the secret Santa gift must also be returned to qualify. Free gift cannot be exchanged for a cash alternative. Offer available on in-stock items only and/or if all items are in stock. We reserve the right to withdraw this offer at any time.